WASHINGTON -- Republican front-runner Donald Trump defended his provocative call for banning Muslims from the United States in Tuesday night's presidential debate as the candidates pushed their own plans for fighting Islamic State militants. Sens. 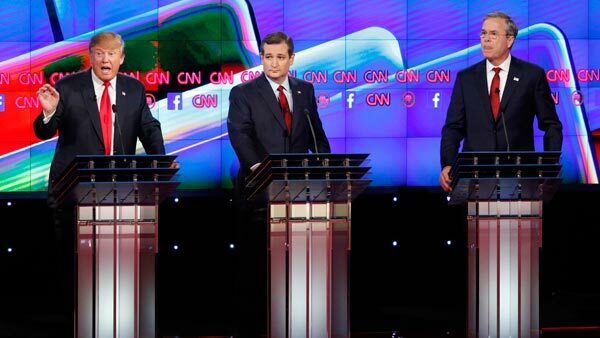 Marco Rubio and Ted Cruz clashed over government access to Americans' communications. Cruz insisted the new law gives the government more access to cellphones and other technology terrorists are more likely to use - a contention Rubio disputed. The senators - both Cuban-Americans in their 40s - also displayed differences in their strategies for targeting the Islamic State. The extremist group claimed responsibility for the Nov. 13 attacks in Paris, and one of the shooters in California pledged allegiance to the group on Facebook shortly before she and her husband shot and killed 14 people at a holiday party.